At least seven Arabs holding large stones ambush Beit El resident on road near the community. Escape was no longer an option. 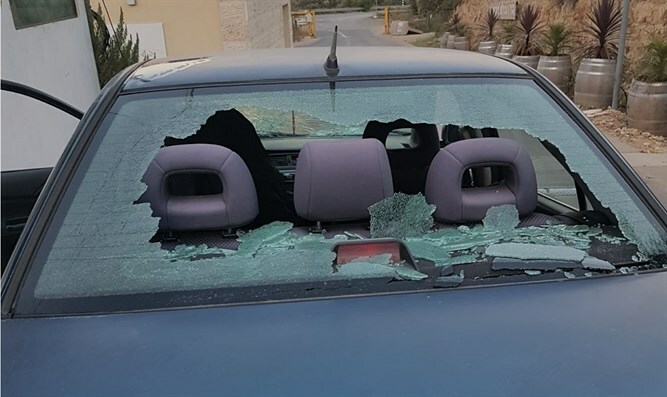 David Mor, a resident of Beit El, was caught yesterday while on the way from his community in a stone-throwing ambush, in which at least seven young Arabs took part. He spoke to Arutz Sheva about the incident, which took place around seven in the evening. Mor described the point where the rioters were waiting with large stones in their hands, the main road leading to Beit El, just after the steep curve of the road facing Givat Assaf. At the point of the road opposite the Arab slaughterhouse, the rioters emerged from the field. "There's a slight drop off the road, the road is a little higher than the field from which they went up to the rail. Not one boy or one guy, but a large group. I saw ten but apparently I did not notice that there were more behind them. I saw them standing very close to the road, very close to the rail, with large stones. The big miracle was that they threw everything on the windshield and on the frame of the car and everything shattered, even in the back. " Describing the moments when he identified the rioters waiting for him on the side of the road, he said that these are moments when "you do not have time. I slowed down the car a bit, I thought to go in reverse but it’s scary, because cars are coming from both sides, so I had no choice but to go through it." "I drove slowly. They were standing very close. I accelerated the car when I got close to them, they threw a lot at the window itself. In the front window I saw six hits, apart from the damage to the frame, and everything was destroyed in the back," he said. "I will say, to the army’s credit, that several cars behind me was an army vehicle that saw the stones on the road and continued to drive forward until the next curve, where I stopped to see what was going on. Thank God I was alone in the car and there was no one sitting in the back, where the window shattered and one would have been hit by the stones," he said.